An estimated 250,000 people assemble for Tetrazzini’s Christmas Eve concert in San Francisco. My recent post about Nellie Melba called to mind Luisa Tetrazzini, who had several things in common with Melba. Tetrazzini was also a soprano—a coloratura whose range extended to the F above high C—and a contemporary of Melba at the beginning of the 20th century. Also like Melba, Tetrazzini had an enormously successful career in opera and concert and was treated like royalty around the world. She was, by reputation, a warm and friendly woman, but one of the few people she didn’t get along was Melba. And Tetrazzini, like Melba, inspired a chef, although there is disagreement about whether the chef was Ernest Arbogast at the Palace Hotel in San Francisco or an unknown practitioner at the Knickerbocker Hotel in New York. The dish involved is “tetrazzini,” which consists of diced chicken or seafood and mushrooms in a sauce of butter, cream, and parmesan, laced with wine or sherry. This is usually served over pasta, although there is no fixed recipe or manner of presentation. Louis Paquet, a chef at the McAlpin Hotel in New York, seems to have had a hand in making this concoction popular. Paquet and Tetrazzini were friends, and he gave her cooking lessons. Click HERE to see an unusual film clip in which the 61-year-old Tetrazzini listens to a recording of Enrico Caruso singing “M’appari” from Martha and breaks into a duet with her old friend. Even at this age and with this quality of reproduction, you can get a sense of the character of her voice. Jack Lawrence: a podiatrist my foot! In my last post, I mentioned Jack Lawrence, who wrote the song “If I Didn’t Care,” which became the signature of The Ink Spots. Their recording of that song in 1939 sold 19 million copies and still ranks as the tenth best-selling single of all time. “Play, Fiddle, Play,” 1932, which Lawrence wrote when he was 20 years old, became an international hit, a favorite of singers, violinists, and orchestras. It earned Lawrence membership in ASCAP at that young age. “All Or Nothing At All,” 1939, with music by Arthur Altman, was Frank Sinatra’s first solo hit. “Never Smile at a Crocodile,” 1939, with music by Frank Churchill, became a children’s classic. “Yes, My Darling Daughter,” 1940, which Lawrence wrote using music from a Ukrainian folk song, was introduced by Dinah Shore on Eddie Cantor’s radio show, and it was Dinah Shore’s first recording—and a hit. “By the Sleepy Lagoon,” 1940, with music written by Eric Coates in 1930, provided hit records for the Harry James Orchestra, Dina Shore, Glenn Miller, Fred Waring and others, including—in 1960—The Platters. “Linda,” 1942, which Lawrence wrote during his tour of duty with the Maritime Service during World War II, was published in 1946. The recording in which Buddy Clark sang this song with the Ray Noble Orchestra, was on the Billboard charts for 17 weeks, peaking at No. 1. The title referred to the five-year-old daughter of Lawrence’s attorney, Lee Eastman. Linda Eastman would be known to later generations as Linda McCartney. “Heave Ho, My Lads! Heave Ho!” 1943, which Lawrence wrote while he was a bandleader at the Maritime Service Sheepshead Bay Training Center, became the official anthem of the Service and the Merchant Marine. “Tenderly,” 1946, with music by Walter Gross, was a hit for Sarah Vaughan in 1947, but went on to become the theme song for Rosemary Clooney. “Beyond the Sea,” 1946, with music from Charles Trenet’s “La Mer,” became indelibly associated with Bobby Darin. “Hold My Hand,” 1950, which Lawrence wrote with Richard Myers, was used in the 1954 film Susan Slept Here and nominated for an Academy Award as best song. Lawrence was born in Brooklyn and, although he was already writing songs when he was still a child, he acceded to his parents’ wishes and, after completing high school, received a doctorate in podiatry—a specialty that was not destined to be his career. Lawrence was gay, and he was the longtime partner of Dr. Walter David Myden, a psychologist and a social worker in Los Angeles. The men met while serving in the Maritime Service. By the 1960s, their relationship was well known in their circles. Lawrence and Myden were major art collectors and, in 1968, they donated about 100 20th century works to the American Pavilion of Art and Design at the Israel Museum in Jerusalem. An interview concerning that donation, published in The New York Times, made no attempt to disguise their relationship—an unusual circumstance at the time but one that Lawrence and Myden could carry off with confidence and dignity. They were major supporters of the Israel Museum, which had just been established. Their donations in 1968 included works by Georgia O’Keeffe, Ben Shahn, John Marin, and Morris Graves. Myden died suddenly of a heart attack in 1975, but Lawrence lived to the age of 96, dying in 2009 after a fall at his Connecticut home. I came across an audio file on YouTube that identified the contents as “a very funky version of ‘Water Boy’ by an unknown artist named Valentine Pringle.” Well, unknown to the writer, maybe, but not unknown to me. I spotted Valentine Pringle in 1962 when Harry Belafonte introduced him on “Talent Scouts,” a short-lived television show with a premise that still has traction. Pringle’s voice, which ranged from tenor to basso profundo, was startling in its beauty and its power. I remembered his name and did everything I could in those pre-internet days to find another opportunity to hear him sing. I was a big consumer of vinyl in those days, and on most Friday nights I would visit Dumont Records in Paterson, New Jersey. 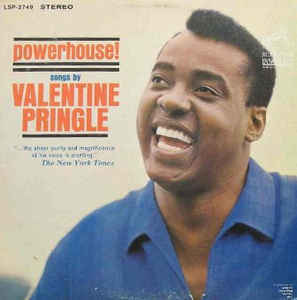 Eventually, Val Pringle did show up at Dumont in two RCA LPs–“I Hear America Singing” (1963) and “Powerhouse” (1964). I still have the vinyl, and “Powerhouse” is now available on CD and iTunes. Pringle made a couple of other recordings; wrote some songs, including “Louise” which he wrote for Belafonte; and had some kind of a career in television and film, but nothing worthy of that voice. The entertainment industry frequently makes no sense to me. In the 1980s Val Pringle and his wife, Thea van Maastrich, moved to Lesotho, a tiny kingdom that is surrounded by South Africa. Pringle had appeared in Lesotho on a cultural exchange tour sponsored by the United States Information Service, and I guess it appealed to him. 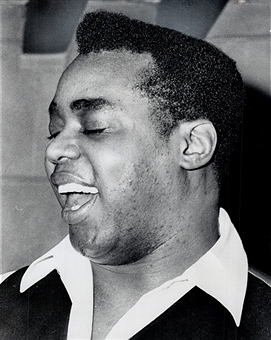 He ran a nightclub and the Lancer’s Inn, a hotel and restaurant in Maseru. 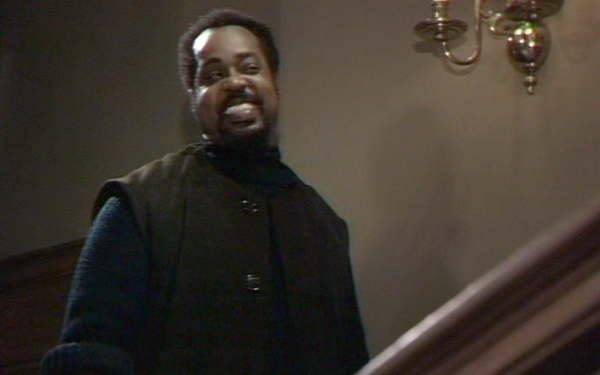 On the night of December 13, 1999, two burglars broke into Pringle’s house. Pringle confronted the men with a pistol, but he was stabbed to death. Two men were caught and convicted of the crime. Pringle had served in the United States Army as a specialist third-class. His ashes are buried in the Arlington National Cemetery. You can hear Pringle sing in various audio files on line, including “Water Boy” HERE, “Old Man River” HERE, “Take This Hammer” HERE, “The Mouse Song” HERE, and “Oh, Freedom” HERE.